During winter weather, the City will continuously monitor conditions and implement a Snow Emergency Plan. The City will spread salt and/or brine on streets to prevent snow from bonding to pavement and will commence to plowing operations as needed. Plowing operations will focus on keeping emergency snow routes clear. When those streets are cleared, plowing will continue on other streets. Residents are advised to monitor weather reports and prepare accordingly. The City will provide information through the local media, the City website, www.hobokennj.gov, Twitter, Facebook, Channel 78 on Cablevision, and other means. Residents can sign up for the City’s Reverse 911 system and to receive alerts directly from the City via email or text messages through the Nixle system. Parking can be more difficult than usual when it snows. Residents may need to move their cars from snow emergency routes to avoid towing, and on-street parking may be more scarce if parking lanes are filled with snow. If snow or ice is predicted, residents who park on-street may wish to consider moving their vehicle to a garage. The City offers overnight parking (8pm to 8am) at a rate of $5.00. This rate is available in Garage B (28 2nd Street), Garage D (215 Hudson Street) and the Midtown Garage (371 4th Street) every day of the year. If the City declares a snow emergency, residents with a valid resident or temporary parking permit may park in Garage B for a rate of $5 per day until the end of the snow emergency. Chapter 168-8 of the municipal code regulates snow removal for private property owners. The City performs proactive inspections and also relies on citizen complaints to help us identify those property owners that are not meeting sidewalk safety requirements. The vast majority of property owners comply with these regulations, but the City will issue fines to those who do not keep sidewalks clear. To report a violation, call the Department of Environmental Services at 201-420-2000 x4000 or submit a complaint through Hoboken311 here. 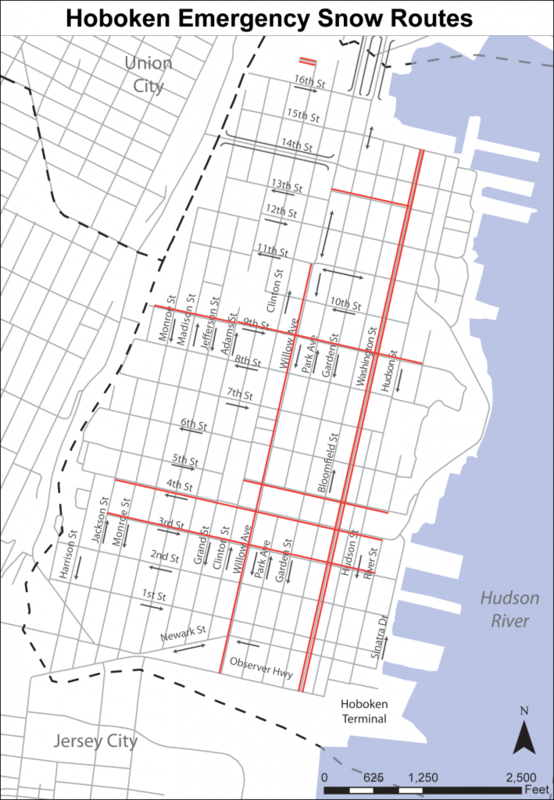 Click here to download a map of Hoboken Emergency Snow Routes [pdf]. ‍The City will open an Operations Command Center during a declared snow emergency. Residents may call the Command Center at 201-420-2230. ‍When a snow emergency has been declared, vehicles may not park along designated snow emergency routes. Vehicles parked on snow emergency routes are subject to towing. During a snow emergency, alternate side parking (street cleaning) regulations will be suspended. ‍When a snow emergency has been declared, $5 per day discounted parking will be made available in Garage B, located at 215 Hudson Street. The rate is valid until the snow emergency has been lifted and is available on a first-come, first-serve basis to residents with valid resident or temporary parking permit. ‍During a snow emergency, all trash pickups are suspended. If there is no snow emergency, trash will be picked up on regular scheduled days. *The following additional measures will take effect at a specified time, depending on weather and road conditions:Suspension of Hop shuttle serviceThe Hop shuttle system will suspend operations. ‍Taxis and limos without snow tires or chains will be banned from operating. Residents can submit snow-related complaints or request service through the City’s online service request system, www.hobokennj.gov/311.